My summer in LA was supposed to end in August; but I was having so much fun pretending to be an LA resident that I extended it two months. 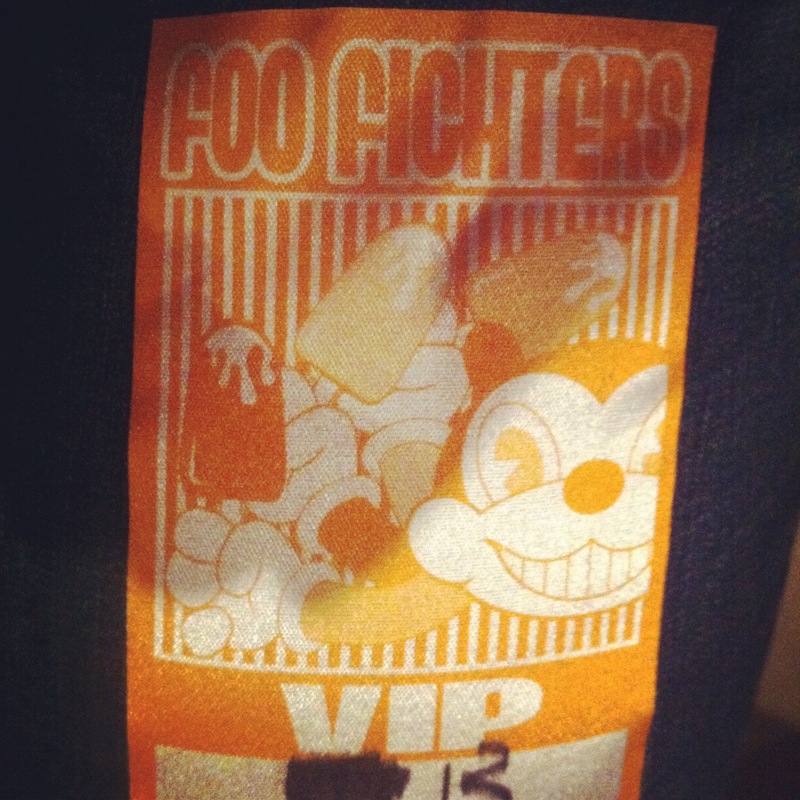 The problem with that is that I missed out on buying tickets to some of Rocktober’s big shows, and Foo Fighters was one of them. I remember being one of those Nirvana elitist teenagers who had a hard time when Dave Grohl moved on and had his own band. But I did own and like the first couple albums, though they didn’t move me in the same way Nirvana did. Then I kinda lost track as I took a break from most new rock and metal for about 5 years in college to delve into classic rock and, oddly enough, hip-hop and dance music. In the first month when I moved to San Francisco, I found out Foo Fighters and Weezer were playing. My boyfriend at the time and I got scalped tickets at the stadium and it was an amazing show. 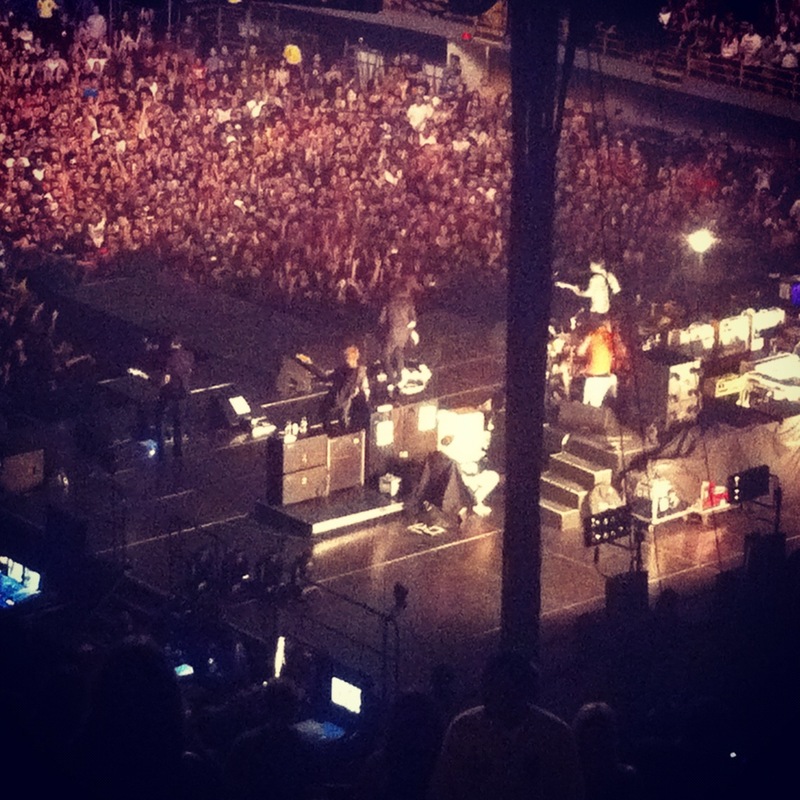 Even though we were far away, Dave Grohl as a frontman made everyone feel included. And it was a show; you laughed, you rocked out, it was just a good time. Fast forward a year, and the next time I saw Foo was at what I generally cite as the answer to a question I am often asked: what’s your favorite show of all time? It was the Bridge School Benefit 2006, a mere months before I started writing this site…so unfortunately I don’t have a good write up of the memory. I had dished out a lot of money for 7th row center tickets because Trent Reznor was performing one of the only solo sets he’s ever done. It was an amazing set, something that felt so special to me. This set was followed by an acoustic Foo set. I wasn’t expecting anything revelatory to occur…until the moment when Grohl announced they were going to play “Marigold”. I grew up rather poor, and when I was 12/13 years old and Nirvana was my favorite band, my parents wouldn’t buy me full CDs. So I’d scrape together a few bucks to buy singles. A B side on the “Heart Shaped Box” single was a song that was sung by Dave Grohl, called “Marigold”…and I always loved it. I never, ever thought I’d hear it live…but October 22nd, 2006 was apparently my day. Fast forward several more years and here I am in LA. A friend of mine had me over to watch the Foo Fighters documentary Back and Forth, and my interest was piqued again (marketing victim!). I was getting ready to fork over the cash for a ticket on Stubhub when a good friend of mine offered a comp seat she got through her work. It would be a partially obstructed view behind the stage…but it’d be free! Getting into The Forum was traffic hell; the line to get into the parking lot stretched for it seemed like a mile…and the bootleg shirt sellers were trying to take advantage and walked amongst the cars in the middle of the street peddling their wares before the venue was even in sight. Once we finally parked, I found out my friend had arranged for Forum Club passes for us. I had no idea what this was, but next thing I know I’m walking into a room filled with vaguely familiar rock stars, actors, athletes, and such. Everyone loves Foo! The one worth mentioning is someone who stopped me in my tracks when I turned around to head to my seat; the famous son of one of the most famous actors of all time who’s now on Dexter. 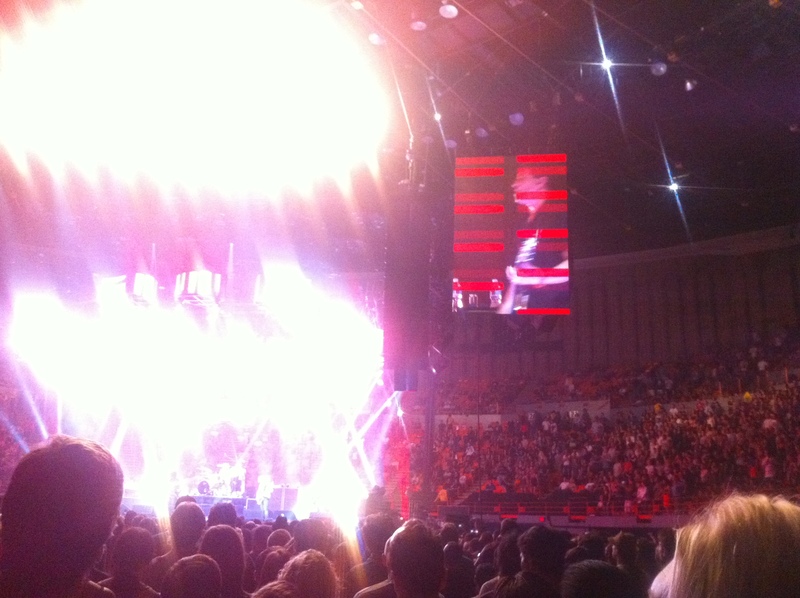 Being the concert geek that I am…I thought the obstructed seats were kinda cool. It was almost a backstage view. And before I knew it, the lights went out, and the stadium erupted in screams. Sometimes, covering so many metal bands, I forget that being a rock star is supposed to be fun. That’s the vibe that oozes from Foo Fighters as they run onto the stage and the crowd goes ballistic. From this perspective, it completely turned the tables on the traditional way I see the band as the show and feel the crowd react around me. This time, the crowd was almost the show to me. To see thousands of faces so happy; faces of people who like mildly heavy rock music! There are this many people who still like rock music?! There are few mainstream acts I can get behind nowadays; this band and Green Day are probably it. And similarly, at most of my shows, the focus is on the cathartic experience, the dark side, the dangerous energy. This was about having a good time! The first time Grohl ran down the ‘catwalk’ through the crowd, I was like “Yes!! Is there still time for me to grow up and be a rock star?” instead of my usual “ahh, this scary looking dude on guitar seems like he’s felt the pain and suffering that has ripped my life to shreds”. “Hiii!! How are you?” were Grohl’s first words to the crowd. This epitomizes the fact that everyone loves him because he seems so down to earth. 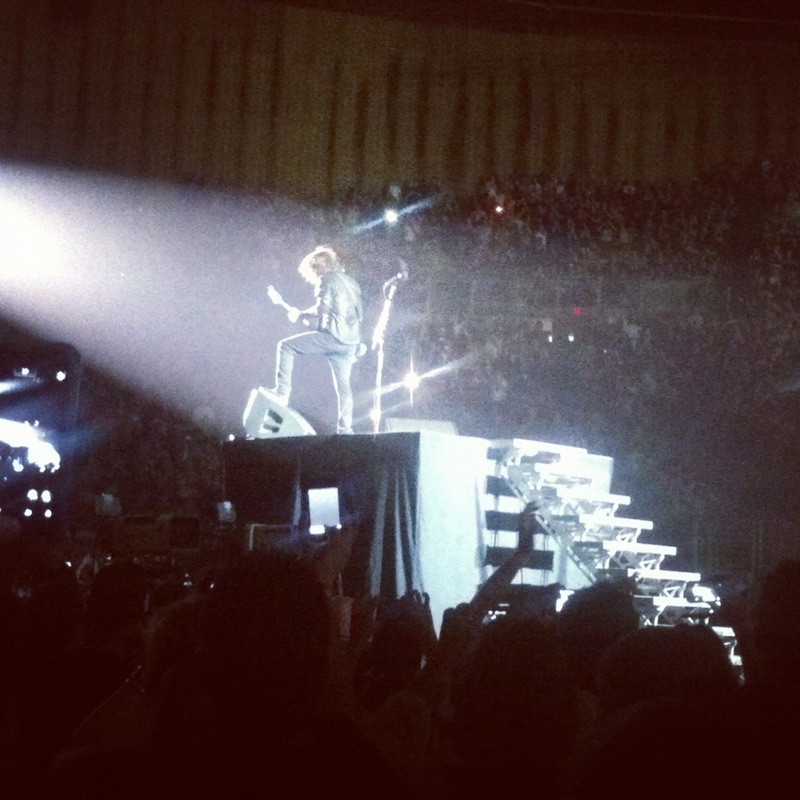 He’s drinking a beer, playing a song, no biggie. Watching the backs of a band always makes me think about the fact that this is their job. Going to as many shows as I do, sometimes the magic of it goes away….and it took this big rock show to bring it back a bit. At that point we were given wristbands so we could go down to the floor. Now we were part of that crowd…and to be honest they were much more fun from afar. I’ll put it this way…metal heads have much better rhythm than mainstream rock people do; the ex-musician/dancer in me wanted to strangle the woman in front of me who kept making all of these offbeat exaggerated moves. There were a lot of people there on date night, father/son duos, and man-dates…at the back where we were standing everyone just seemed a little unsure of what they were seeing. The Foo Fighters’ stage setup is very straightforward, but they had a live video feed on either side of the stage with effects laid over the images that were TERRIBLE…I don’t know who’s idea that was, but it was not a good one. I don’t listen to Foo that much, but they do have some great songs…and oddly enough I like the slower ones best…”The Pretender”, “My Hero”, “Skin and Bones”, “Times Like These” and “Best of You”…those two in particular are fantastic. And then there are the early ones like “Everlong” and “Monkey Wrench” which remind me of high school. “Breathe out, so I can breathe you in“….so perfect. To hear everyone in the arena sing in unison, that’s when you really feel the power of music. It starts with a few notes, some lyrics…and then it becomes something so much bigger that it’s parts. Usually the band introductions time in a set is kinda awkward, but Foo spruced it up by having them each say what their first show at The Forum was. Pat Smear’s was The Rolling Stones with Stevie Wonder opening…!!! That was nicely tied together with Grohl saying some kid in the audience will be on that stage saying this was his first show at The Forum. I’d really like to think that’s the case; if any band has a chance of inspiring a kid to grow up to be a rock star, I’d think this is one of them. We left at the end of the main set so I missed what I heard was a great encore; but knowing how hard it is to escape The Forum after a show, I was fine with this. I’ve learned in my time in LA that great nights like this can just fall together if you’re open to them and know the right people. I’ve got so many great friends here, and there are so many amazing things to do at all times…pretending to be an LA resident is by far one of the best decisions I’ve ever made. Ha! My friend was feeling faint from the heat…that’s the main reason we had to leave early. Bridge 2006 was soooooo good….